Spring, Texas – September 13th, 2015: The first time that I walked in to Le Pam’s House of Creole, I was greeted by the most welcoming lady (owner and chef Pamela Graham). I took a few steps forward and she could tell it was my first time there. She gave me a sample of her Gumbo and I was instantly glad I decided to walk in. I knew I had found “flavor town!”. Pam instantly makes you feel like you are in her house and you are a friend or family that has come for her authentic New Orleans creole/Cajun cooking. In the front is a steam table containing today’s entrées and sides. The menu board above the steam table has some of Le Pam’s regular made-to-order dishes, like the best Po-Boy I have had in a very long time with bread shipped in from New Orleans. The shrimp are so fresh I swear they jumped out of the ocean, peeled themselves in the air. Landed in her wonderfully seasoned batter and asked Pam to fry them up. 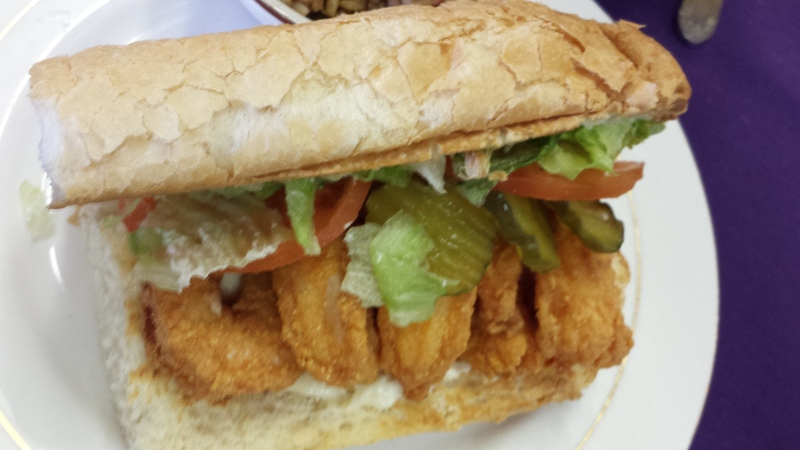 These are not tiny shrimp like other po-boys I have had. I have told many of our area foodies and friends about Le Pam’s House of Creole and most of them are hooked after one visit. Most of them so far agree with me that Pam’s personality is so great and if a personality has to match someone’s cooking, this is a match made in heaven. Both Pam and her cooking are a little bit spicy, a lot enjoyable and as welcoming as New Orleans. Chef Pam, what inspired your menu and did you go to a cooking school? After extensive research Houston, Texas was the obvious choice both economically and an opportunity to introduce Houstonians to Original New Orleans Cuisine. Every Sunday you have something called “Sunday Dinner”. Tell our readers what that is exactly. Every Sunday we went to church and always ended up at my Grandmother’s house for Sunday dinner. It is a tradition that I want to share with everyone I come in contact with. Judging by your welcoming personality, I can tell that customer service is very important to you. What sets you apart from the other chain Cajun/Creole places? First I am not a chain or a restaurant. I am your home away from home, and I greet everyone as a part of my family. After tasting your Bread Pudding with VSOP Brandy Sauce and Cobblers, you can bake too. Are these family recipes or did you make them up yourself? Every item on my menu including desserts are a labor of love and took many years to perfect. I hope to pass on my recipes to our son Cordero Sr. who is an executive chef. I have already talked about the amazing freshness of your Shrimp, but I would love to know where your seafood comes from? This is my only advantage being a small business and I choose not to disclose who my resources are. Just know that I am always striving to provide my family with the highest quality ingredients. Speaking of freshness, do you cook everything from scratch? Also why do you choose to get your bread from Louisiana? Yes of course I do. There is nothing to compare to New Orleans French Bread. The soft buttery crust and light airy bread make a Po Boy what we know it to be, there is no substitution for New Orleans Bread. If you had to describe your restaurant in 5 words, what will they be?